You are here: Home � All Deals , Retail: Clothing Toys Baby Shoes Children � 405 Piece Lego Ultimate Building Set for $19.99! A great Christmas gift for children over the age of 3. 405 Piece Lego Ultimate Building Set for $19.99! A great Christmas gift for children over the age of 3. Amazon.com is currently selling a 405 piece LEGO Ultimate Building Set for only $19.99. The next cheapest we could find was still $13 more expensive. If you don't have Amazon Prime remember you can add something like a book or a different Lego set of $5.01 or more for free shipping. The reviews for this gift are very strong with the majority of people giving it 5 stars as of this posting. It should be noted that for children 3 and under, this gift could be considered a choking hazard. 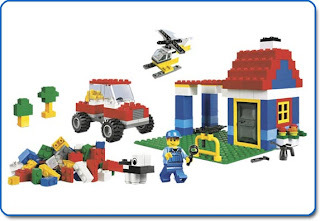 Lego claims that this set has the pieces to build things such as a house, a car, a dog, helicopter, a barn, a Castle, and more. Click here to check out this this deal and its reviews. Hi my name is Kevin, Owner of MightyBuying.com. When I first created this webpage I had a simple goal in mind, to build a website that allowed people to get quality reviews, coupons, discounts, freebies, and deals on the web. A lot of effort is made to get deals that the other guys missed. We hope you come back from time to time to keep dibs on the hottest deals on the internet! We welcome you to follow us via Facebook, Twitter, Email, or RSS. If you want even more information about this page checkout our About Us page. Thanks for stopping by! '; document.write(trtd); j++; } } document.write("